One of the most popular elements of the Marvel Cinematic Universe thus far has been the delicious evil of Thor's adopted brother, Loki. As portrayed by English actor Tom Hiddleston, the character wreaked havoc in Thor and The Avengers, and his lust for power (and ill-conceived alliance with Thanos) ultimately served as the device to finally unite Earth's Mightiest Heroes. However, it's looking like the god of mischief will play a far less crucial role in the overall scheme of Marvel's Phase Two. He'll appear in this fall's Thor: The Dark World – paying penance for his crimes and possibly seeking some form of redemption – but writer/director Joss Whedon has gone on record saying that Loki will not return in the Avengers sequel. Now that claim looks to be even more official. "He’s not in it. 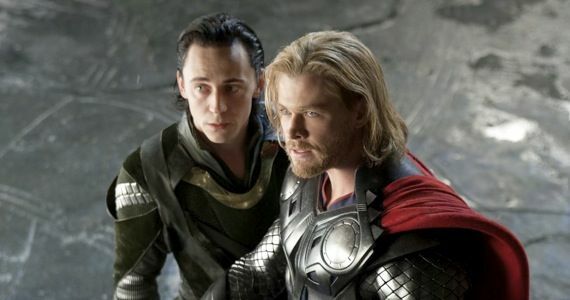 Here’s the thing: I don’t think there’s anything else Loki could contribute to 'The Avengers,' narratively. Joss gave me so many wonderful things to do in that first film that we’d only be trying to repeat ourselves, and probably less well in the second one." Given previous reports, the news is not a particularly surprising one. After all, the world of The Avengers is undeniably an ensemble cast, and despite his proven skill for balancing a large number of characters, even Whedon has his limits. Case in point, Age of Ultron will reportedly see expanded roles for both Black Widow (Scarlett Johansson) and Hawkeye (Jeremy Renner). Plus, new characters like Quicksilver, Scarlet Witch and (of course) the titular villain mean that perhaps cutting Loki from the film is the best way to prevent the story from becoming too bogged down, a point Hiddleston himself is quick to acknowledge. If anything, it will only help preserve Loki's place as a memorable movie villain in the first film. "When I think of all the things I loved as a child, for example, Hans Gruber wasn’t in 'Die Hard 2.' And in 'Indiana Jones,' by the time he moved from the 'Lost Ark' to the 'Temple of Doom,' there was a whole new bad guy. I think keeping it fresh and new is good for 'The Avengers' even though it’s a shame for me. And let’s face it, there’s seven or eight of them as it is, and Joss is thinking about adding two more, so the screen’s gonna be a busy place. But I had the time of my life on that film. It was the most fun ever." Perhaps Loki will confront the Avengers in another film down the line – assuming that his absence in Age of Ultron doesn’t imply that the character's fate is in jeopardy – but in the meantime, Hiddleston is looking forward to continuing his character's arc in the upcoming Thor sequel. "Oh, I’ve got plenty to do in 'Thor ,' believe me. A lot of new stuff. It’s a new iteration of the character. It’s a new development. Another trick, another poker game for the god of mischief. And he plays it well." Are you disappointed that Loki will miss out on Avengers: Age of Ultron, or are you glad that Marvel is mixing it up in Phase Two? Let us know in the comments section below. Thor: The Dark World opens in theaters on November 8th, 2013, Captain America: The Winter Soldier on April 4th, 2014, Guardians of the Galaxy on August 1st, 2014, Avengers: Age of Ultron on May 1st, 2015, Ant-Man on November 6th, 2015, and more unannounced Marvel films for May 6th, 2016, July 8th, 2016 and May 5th, 2017.